Things like 100-mile breakfasts and sustainable farming practices and even fair market restaurants and foods have been cropping up all over the country. Well if you want to have a meal, and know exactly where it came from, look no further than the bay front in Newport. Framed by the historic Yaquina Bay Bridge and Newport’s fishing fleet, Bay Boulevard is the place to go in Newport if you are looking for a lunch or dinner of fresh seafood. During my visit to Newport, we discovered Local Ocean, a seafood market that is literally across the street from the docks where the fishing fleet is docked. You walk in and immediately see a case filled with the day’s catch, and to your left are chairs and tables surrounding the open-air kitchen. There is no hiding the chefs in the back, you can even sit at the bar and watch them cook. 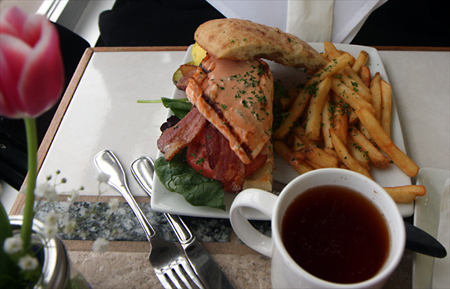 The first night I visited, I had a salmon BLT, which I was rather dubious about. But when the meal came not only was it too much for me to finish, but it was the best BLT I have had in my life. The next night – yes my wife and I ate there two nights in a row – I tried the fish and chips. Basically it was a large fillet a fish, atop a bed of home-made French fries and fennel slaw and again was excellent. The unique part about Local Ocean is that during the spring and summer months, when the weather allows, there is a large glass garage door that is opened, and the dining room extends out onto the sidewalk. You can smell the ocean, and hear the sounds of the harbor as the boats come in from a day’s fishing. Beer lovers can’t visit Newport without taking a trip to one of the Rogue Ale locations in the city. The Rogue Ale Public House, down the street from Local Ocean, was opened in May 1989 and was originally called the Bayfront Brewery. If you haven’t guessed yet, you come here to drink beer, however the food is also very, very good. There are more than 35 beers on tap, and there is a special “shot” of the day, that you can taste and even take a jug, called a 64-ounce “Growler,” home with you. Pub food is the theme, but this Pub food impresses with Kobe beef, amazing bleu cheese, pizza and, yes, seafood. To be honest, I don’t remember much of my visit because, quite honestly, the beer was really, really good – hey, if you have a designated driver like I did, take advantage! The trick with Sharks – a place my wife and I have enjoyed for more than 15 years – is to find out when it is open. If you plan ahead, you will be rewarded with some of the best steamed seafood on the West Coast. Shark’s Seafood Bar and Steamer Company is very intimate and uses steamers instead of fryers and grills to cook the seafood. The signature dish is Cioppino, or a seafood stew with red sauce that is amazing. From gumbo to stew to bouillabaisse to steamed crab and fish – there is something on the menu that will get you drooling. You can also sit at the bar and watch the steaming process work, and it is unique to the Oregon coast, so sit back and enjoy. About Bay Boulevard: Bay Boulevard features not only great restaurants, but also candy stores, coffee shops, gift shops and art galleries. In addition you will find the fishing fleet and several charter boat services to head out to go fish if you want. There are several great restaurants along the boulevard, so you could spend a weekend just eating your way down the bay front. What to bring: Your appetite and a designated driver if you want to enjoy ample amounts of Rogue Ales. Tip: During the summer months parking can be tricky, so give yourself extra time. You may end up parking up the hill a bit, which is a good start to working off some of the amazing food that is offered on the bay front. In addition, Shark’s schedule is off and on, so calling ahead would be a very good idea. Season: The restaurants are open year-round.